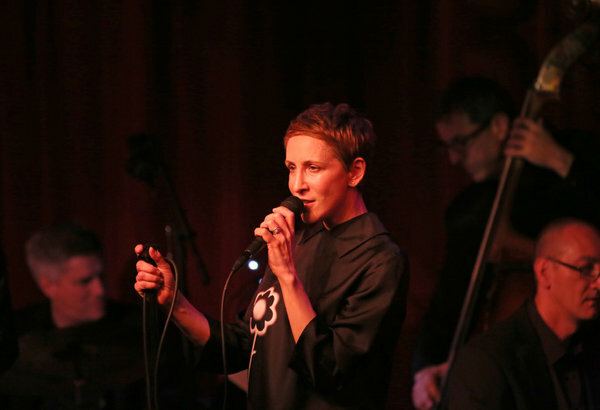 Stacey Kent performing at Birdland. With her bright, alluring sliver of a voice — a darting musical tongue of flame — Stacey Kent has few of the traits commonly associated with jazz singing. Yet with her lightly swinging delivery, curt phrasing and attraction to Brazilian bossa nova, she is a jazz singer in the iconoclastic mode of the much-missed Blossom Dearie, whom some critics wrongly dismissed as more cabaret than jazz. Instead of Louis Armstrong and Ella Fitzgerald, the spirits who guide Ms. Kent belong to the Brazilians, Antônio Carlos Jobim, and João and Astrud Gilberto. Dreaminess trumps realism. Ms. Kent and her husband, the saxophonist Jim Tomlinson, suggest a latter-day answer to Ms. Gilberto and Stan Getz, whose early recordings remain the foundation of what they do. And on Tuesday evening at Birdland, where Ms. Kent and Mr. Tomlinson arrived for their annual New York City appearance, the opening set was sprinkled with Jobim songs, animated as much by Mr. Tomlinson’s intensely smoky solos as by Ms. Kent’s girlish chirp. But there is more. In recent years the novelist Kazuo Ishiguro, who writes fanciful, mildly surreal lyrics to Mr. Tomlinson’s music, has given Ms. Kent a quasi-literary identity. The portrait evoked by their collaborations is that of a reflective free spirit and latter-day romantic cautiously following her exploratory instincts. Although Ms. Kent has an introspective side, you could never describe her sensibility as tragic or even deeply sad. She projects an innate buoyancy. Ms. Kent’s other defining characteristic is her pan-European musical outlook. She grew up in New Jersey, but she and her husband are based in England and have built up large followings in France and Germany. In her 2010 album, “Raconte-Moi,” Ms. Kent sings in fluent French. It all made for a heady mixture in a show that was a kind of retrospective, the high points being the Sammy Cahn-Benny Carter standard “Only Trust Your Heart,” and a Tomlinson-Ishiguro collaboration, “The Changing Lights,” a song that defines Ms. Kent and Mr. Tomlinson as sophisticated, cosmopolitan jazz impressionists. This entry was posted in Brazil, Events, Expanding Audiences. Bookmark the permalink.